Mmmm, there’s not much more that I love on a blustery day than some good homemade soup. Today was so windy that when I ran a few errands in Chinatown most of the electricity in shops and many of the traffic lights were down! Thankfully, just 4 blocks east in our cozy little apartment, things were business as usual. All of this crazy weather we’ve been having lately (from torrential downpours to snow and now blustery winds) makes a hot bowl full of soup seem extra nice. 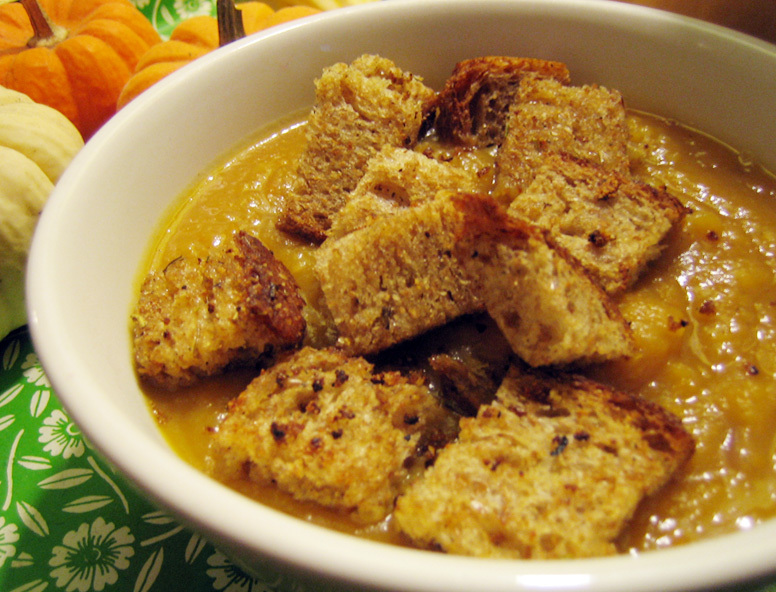 After using only half a can of pumpkin puree for yesterday’s pumpkin loaf, I knew that soup was on the agenda for tonight’s meal. I looked about and found a gigantic sweet potato (or a “big, fat, hairy tuber” as Cornelius refered to the hideous beast), a couple of carrots and a few other random veggies and got down to business. After a bit of peeling, chopping and a nice rapid boil, soup was on! This soup had the right amount of sweet and heat and really felt luxurious and rich in my mouth. So creamy and full of flavour that after every bite I exclaimed, “oh wow, this is good!”. Seriously good and smooth like velvet. 1. In a large pot, heat oil or butter and add in vegetables. Saute until fragrant. Add salt and pepper and enough water or broth to cover vegetables. Bring to a boil. When vegetables are tender, about 20 minutes or so, add in spices, pumpkin puree and maple syrup. Stir well and continue to cook another 5 minutes. 2. Puree with an emersion blender until no lumps remain. Add salt and pepper to taste, if necessary, and serve. what a great soup..and so easy! Isn’t this weather nuts? I am going out tommorow to get a can of pumpkin puree! I like the jumbo croutons, too. hag, vancouver weather is going nuts! and a can of pumpkin can be a girl’s best friend! joanne, i had to make the croutons in order to get my husband to eat the soup! he’s so not a soup fan, so the more i can add that makes it less soupy, the better! Sounds incredibly warming and filling! I love it. Your soup looks wonderful, can’t beat something spicy on a cold day! It’s pouring down rain outside right now and this soup sounds so nice and cozy! anon, it really was the perfect thing. hit the spot. totally. alison, i totally agree! soup was just the ticket. nicole, well you better go & make some soup then! Mo, I think you can just use a smokey paprika or just leave it out altogether. what if you don’t have an immersion blender what can you to blend it all together? Ambo, if you don’t have an immersion blender, you can use a regular blender or just mash it up with a potato masher. Or you could leave it chunky since that’s the way my husband actually prefers soups!